Today almost a year after we started this special JJIE Virtual World Journalism Project, we published the centerpiece of our student labors, the story and the machinima mini-documentary video: Christopher: A Child Abandoned, Deprived & Imprisoned. It was published on the Juvenile Justice Information Exchange (JJIE.org) and simultaneously by The Crime Report housed at the Center on Media, Crime and Justice at the John Jay College of Criminal Justice in New York. Both publications have a national reach to both general audience and those most interested in youth justice issues. The finished story and machinima speak to the truly amazing work of the 11 students at Kennesaw State University, who did all the digging through thousands of pages of documents and traveling the state of Georgia for key interviews. All with the hope that Christopher Thomas’ story could be told widely to prevent him from being hidden from public view in Georgia prisons, which too often act as our country’s Gulags for young men of color. You can hear a synopsis of the story at Georgia Public Radio’s (GPB) Second Thoughts program, where host Celeste Headlee interviews Kennesaw State University professor Leonard Witt, who oversaw the project, and project student Anastaciah Ondieki. Project supervising professor Leonard Witt (left and far right), Georgia GPB Second Thoughts radio show host Celeste Headlee (second from left) and project student Anastaciah Ondieki (center) at GPB studio. Christopher Thomas still has one more chance for the Georgia courts to amend his 40-year sentence thanks to the work of Stephen Reba, director of the Barton Law Center’s Appeal for Youth Clinic at Emory University. Reba has been trying to find justice for Thomas for years. Of course, we will keep everyone posted on that outcome. Until then, thanks so much for watching this project unfold and special thanks again to Gwenette Writer Sinclair, who oversaw the virtual world sections of the project and to the Kennesaw State University students, including: Claire Bohrer, Kassidy Callahan, Kevin Enners, Ariel Greenaway, Cristina Guerra, Jourdan McGhee, Camille Moore, Anastaciah Ondieki and Jackson Walsh. As if it was not a grand enough honor to present the JJIE Virtual World Journalism Project at the 17th International Symposium on Online Journalism last night, the research team was pleasantly surprised and greatly honored when presented with the ISOJ Top Rated Research Paper award for the project’s research, Journalism: How One University Used Virtual Worlds to Tell True Stories. 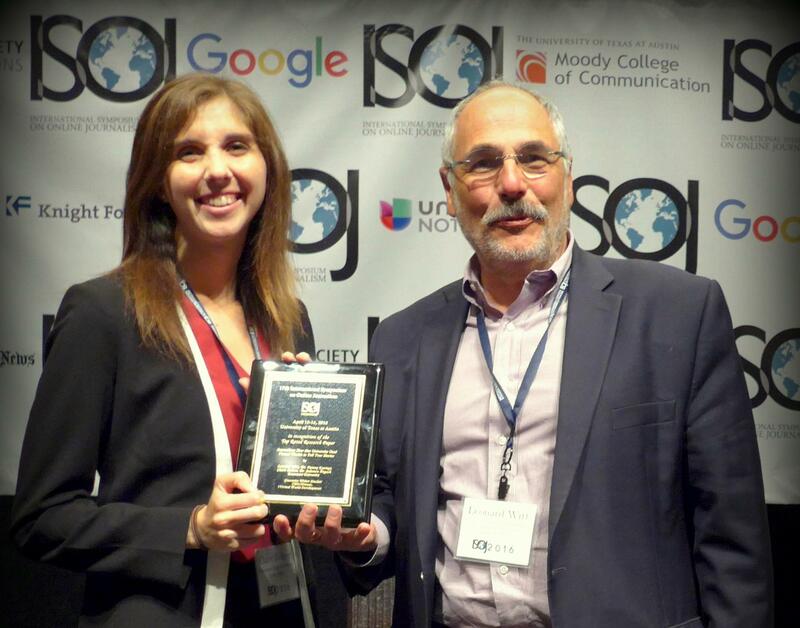 Leonard Witt and Claire Bohrer accept the ISOJ Top Rated Research Paper award on behalf of the entire JJIE Virtual World Journalism research team. All of us from the JJIE Virtual World Journalism Project Research Team would like to thank the #ISOJ for the opportunity to share our work at the conference in Austin, TX this weekend. Moreover, we’d like to thank all who were involved with the project (aside from members of the research team), including ONA, who provided us with the funding to make the project possible, the JJIE staff members and Jim Walls, who taught us valuable lessons about investigative journalism, Fred Lewis and Claudette Enners, who supported and assisted with helpful knowledge during our weekly meetings, all our interviewees (from Steve Reba at the Barton Law Clinic at Emory who introduced us to the Christopher story, and Pete Colbenson, who shared his knowledge of juvenile justice, to the many people we interviewed to cover the stories), Kennesaw State University students and faculty who attended our campus presentation and helped to facilitate discussion of immersive journalism on campus, and lastly, the eleven student interns who worked tirelessly and collaboratively for 15+ weeks to bring this project to life. Thank you everyone! For anyone interested in learning more about the project, visiting the JJIE Virtual World with your own avatar, or starting a similar project of your own, please do not hesitate to contact us directly through this site. Also, please continue to follow our progress blog, as we ultimately hope to continue our project to expand the knowledge and possibilities of virtual world immersive journalism. For the past six months, members of the JJIE Virtual World Journalism team, Leonard Witt, Gwenette Writer Sinclair, Farooq Kperogi, Claire Bohrer and Solomon Negash have been working to compile the whole process and results discovered from the JJIE Virtual World Journalism Project into one cohesive research paper. Finally, after all of the long hours of research, writing, and much collaboration, the JJIE Virtual World Journalism Project Research paper, Journalism: How One University Used Virtual Worlds to Tell True Stories, was published to #ISOJ, the official research journal of ISOJ, today, April 15, 2016. Read our journal article online here. Along with the paper’s publication in the #ISOJ journal, the team was invited to present at The 17th International Symposium on Online Journalism in Austin, Texas, April 15-16, 2016. Today, April 15, between 4:45 – 6:00PM (Central Time), Leonard Witt, Gwenette Writer Sinclair and Claire Bohrer, as a part of a Research Panel, presented the JJIE Virtual World Journalism Project research on teaching immersive journalism in virtual worlds at universities. You can view our presentation, along with all the other insightful presentations from various international editors, producers, executives, and academics on the ISOJ livestream. Look for us just after the 8:40:00 mark. As promised, the JJIE Virtual World Team will be presenting their fifteen + weeks of hard work to Kennesaw State University on Monday, February 8. If you are a KSU student or faculty member, you have probably seen the multiple e-mails and flyers around campus regarding the project presentation. If you have yet to be informed about the presentation, below are the presentation details. Immersive Journalism. It’s the “ultimate empathy machine,” says Nonny de la Peña, journalist and pioneer of immersive journalism in the virtual world. This past semester, a group of KSU students experimented with this concept when they used traditional journalism principles in the virtual world to tell real stories of youth in the Juvenile Justice System. 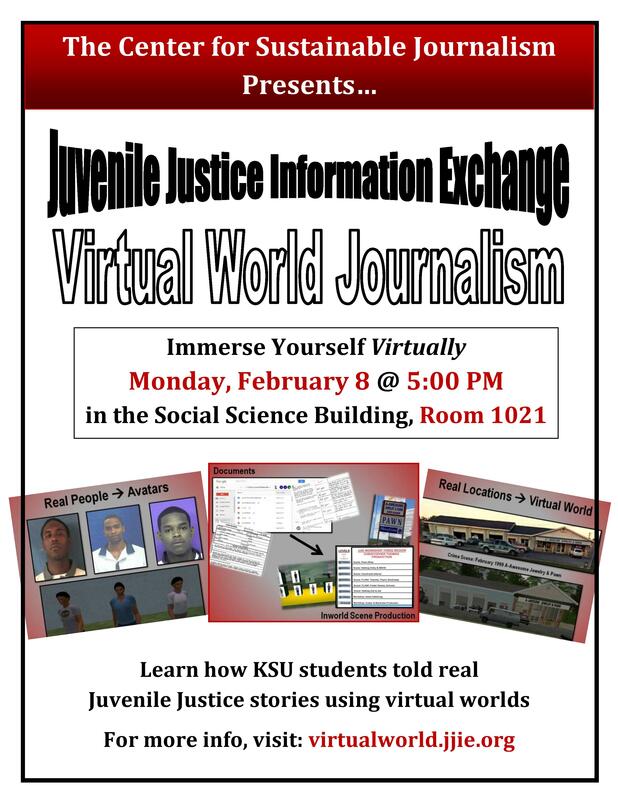 Come to the Juvenile Justice Information Exchange: Virtual World Journalism presentation to experience this “ultimate empathy machine,” learn about an emerging journalism platform and see how to use it. 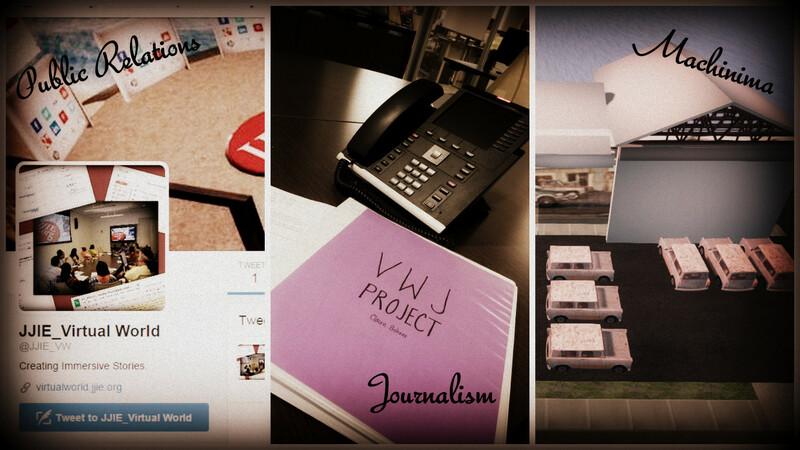 Now that the internship is officially over, the JJIE Virtual World Team is finally presenting their work to the world. Presentations began with CNN in December, and now, we plan to present to the students and faculty at Kennesaw State University. Below is a video we created to give our audience an overview of the project. Two weeks ago, Edward Thomas, the Product Manager of Mobile & Emerging Technology at CNN invited the JJIE Virtual Worlds Team to present the project at CNN. At 11 a.m. today, seven members of the JJIE Virtual Worlds team, along with Publisher & Executive Director of the Center for Sustainable Journalism (CSJ), Professor Leonard Witt, CSJ Executive Editor John Fleming, Metaverse Strategist, Designer and Trainer Gwenette Writer-Sinclair, and JJIE web producer Christopher Hayden presented the result of a semester of hard work and dedication. The primary goal of this presentation was to introduce our work to CNN producers, perhaps with the prospect of doing further collaborative experimentational work in the intersection of virtual reality and journalism. The Center for Sustainable Journalism would bring together college students, providing them with educational and experiential opportunities, as they work with virtual reality immersive journalism projects in collaboration with CNN. In ongoing collaboration with the VW team, CNN product managers would provide the VW team with concepts based on CNN’s specific needs in the exploration of virtual reality storytelling techniques. The VW team would design virtual world interactive scenarios and immersive journalism experiences, and then come back to the CNN team for critiques and collaborative improvements to reach project goals. 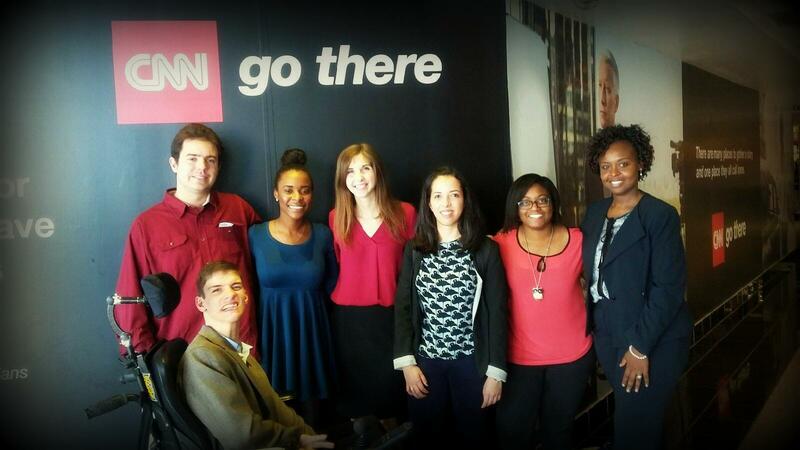 Seven JJIE Virtual Worlds student interns (left to right; Jackson Walsh, Kevin Enners, Camille Moore, Claire Bohrer, Cristina Guerra, Ariel Greenaway, Anastaciah Ondieki) at the CNN Center. Based on the interest of CNN, one of the world’s largest news organizations, in considering a long-term relationship with the virtual worlds team, I believe it’s safe to say that the team did excellent work, which clearly paid off with recognition and possible future collaborations. The Christopher Thomas story is still a work in progress. The long text story needs to be edited once more before presenting it to CSJ editor John Fleming for possible JJIE publication. Furthermore, the machinima story, which was the initial, sole end product of this project (wow, how that has changed), must be re-edited into a final draft before its public debut. The machinima “Forgive” is also a work in progress. Students Jackson Walsh and Cristina Guerra will continue to collaborate with Gwenette to complete their creative translation of a teenage girl’s poem to an emotionally evocative machinima. Student researcher Claire Bohrer will continue to conduct research around this project to determine the effect of virtual worlds journalism versus textual journalism on an audience. As we wrap up our main Christopher Thomas Story and our Forgive machinima, we are eager to see how many more doors can be opened and partnerships created with this ever-expanding project. The smorgasbord of breakfast foods and the enthusiastic conversation at the fifteenth and final group meeting this morning at 8AM brought back memories of the very first group meeting 4 months ago. At the first group meeting, all the interns eagerly gathered together, meeting each other for the first time, openly discussing their initial thoughts and expectations of the project. However, at this final group meeting, the chatter was more of an exchange between close friends, expressing a mixture of emotions, from excitement to sadness about the end of the project. Professor Leonard Witt discusses the Christopher long-text story with the group. 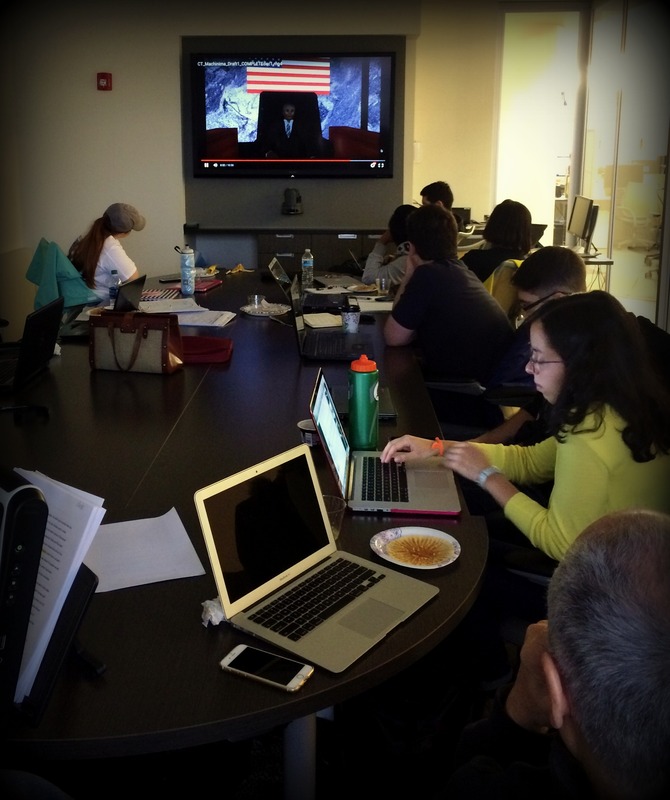 The entire group watches the first draft of the Christopher machinima for the first time. Although today was the final official group meeting, the project is still not complete. While the journalists are still editing their individual segments and the full long-text story, the machinimists are working to perfect the first draft of the Christopher Thomas story, which was debuted at the meeting today. Furthermore, the campus-wide presentation of the immersive journalism project will be presented to all students and faculty at Kennesaw State University in January. Since there is still much to be done for the completion of the project, a few of the interns’ contracts will be extended so that they can finish the project throughout December, January, and as long as it takes to complete the project. 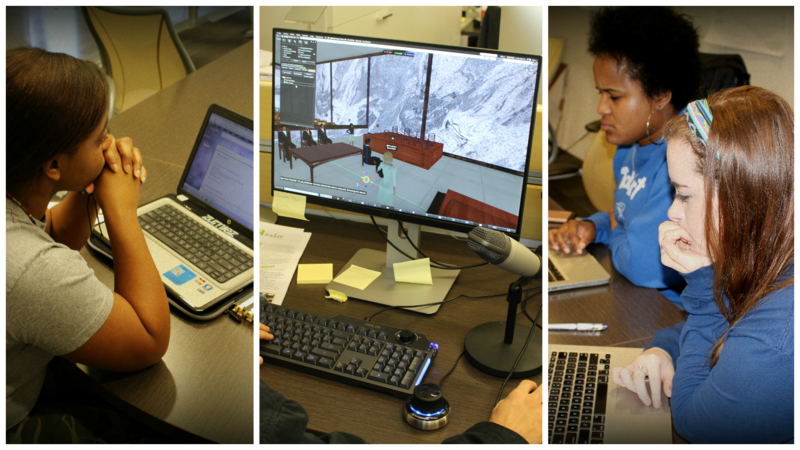 Next week, all JJIE Virtual Worlds interns who are available will meet one more time for a final group meeting on Wednesday, December 9. Since next week is the university’s exam week, all interns will not be required to be at the meeting. However, for those who will be attending, they will prepare for a CNN presentation on December 11th. Along with this, student researcher, Claire Bohrer will be collecting information via survey and interviews for her research of the project’s process and progression, and to answer the overarching question: What can journalism professors, students and professionals learn from this nine-month experiment of using virtual world platforms to tell real-world journalism stories? Since the entire group will not be meeting again until the January presentation, goodbyes and thank yous were exchanged, as we realized the rapidly approaching finish line of this long, tireless, enlightening journey, the reveal of its success in informing the public on very important issues in the Juvenile Justice System and more, the very real possibility of changing Christopher Thomas’s life, and of course, the dire need to document the producers of this project through a group photo. Although this week is called “Thanksgiving Break” by Kennesaw State University, the JJIE Virtual World interns are certainly not abiding by the regular, relaxing procedures of a student vacation break. Since last week’s fourteenth group meeting, the team has been constantly busy with the project’s deadline in site. At the start of the project, December 2nd was noted as the day the entire project would be finally and fully brought to fruition. It is the day that the compiled long text story will be fully written as a first draft; the day the machinima will be nearly complete; the day that the project will be even closer to its completion and its university debut in January. This week and last week, each group had a specific focus. As the journalists finish their individual story segments, the journalism team looks forward to what the full long text story will look like: from the writing to the pictures and the entire presentation for publication. Collaboration on segments, photo gathering, and Christopher Thomas family interviews is the group’s main focus right now. The machinima team built the court room last week, which will be a main scene in the final machinima. Last week and this week, the machinimist’s main focus has been filming and editing. During last week’s group meeting, the PR team was set on searching for grants. This will be their main focus as we head into our final weeks of the project. Overall, the team knows that their work is not yet finished. So this “break” has been used as extra time to further the project’s progress as we approach our final deadlines. 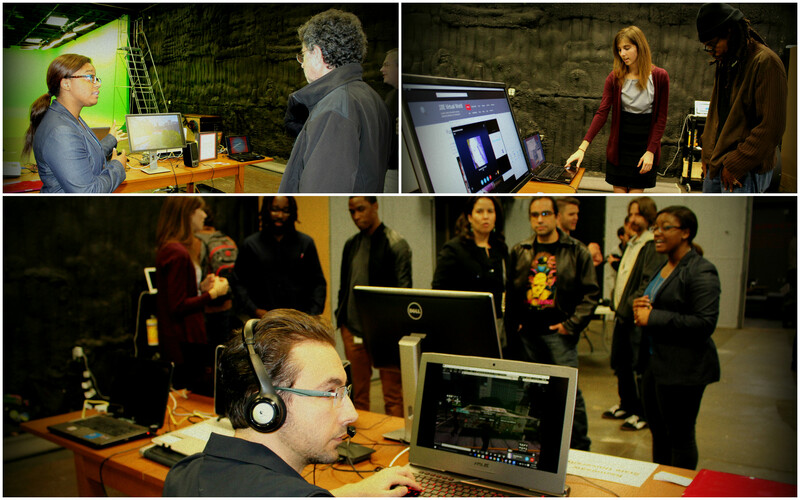 Over 100 people attended the Virtual Reality MeetUp at the Trick 3D Gallery in Atlanta, Georgia, tonight. Defined as an “evening of virtual reality exhibits,” this convention welcomed a crowd of virtual reality enthusiasts, current users, business people, and others who were interested to discover the latest developments in virtual reality. This first-ever virtual reality gallery night in Atlanta was the platform for the JJIE Virtual World team’s first in-person showcase of the project: Marginalized Youth Voices Amplified in Virtual Worlds. Interns Claire Bohrer, Ariel Greenaway, Cristina Guerra and JJIE technologist, Christopher Hayden produced and ran the exhibit as they provided explanations of the project’s fruition, progression and objectives. Gwenette Writer Sinclair, our virtual reality specialist, was also present inworld to introduce people to our JJIE world in OpenSimulator and to answer any deeper virtual reality questions. By the end of the night, the team had talked with various people who were enthusiastic about the project and who wanted to connect to learn more. The support from the crowd and other VR presenters was extremely encouraging, and only motivated the further growth and promotion of the project. The JJIE Virtual World team would like to thank Annie Eaton, the Chief Executive Officer at ATLvr who coordinated the MeetUp. We could not have asked for a better event for our project’s first showcase. Our JJIE Virtual World thirteenth group meeting was similar to last week’s meeting. We all arrived at the Center for Sustainable Journalism at 9AM and then split up into our specific groups. The main incentive for today’s small group meetings was simple: push forward to complete the remaining tasks to create the most effective presentation for Christopher’s story. 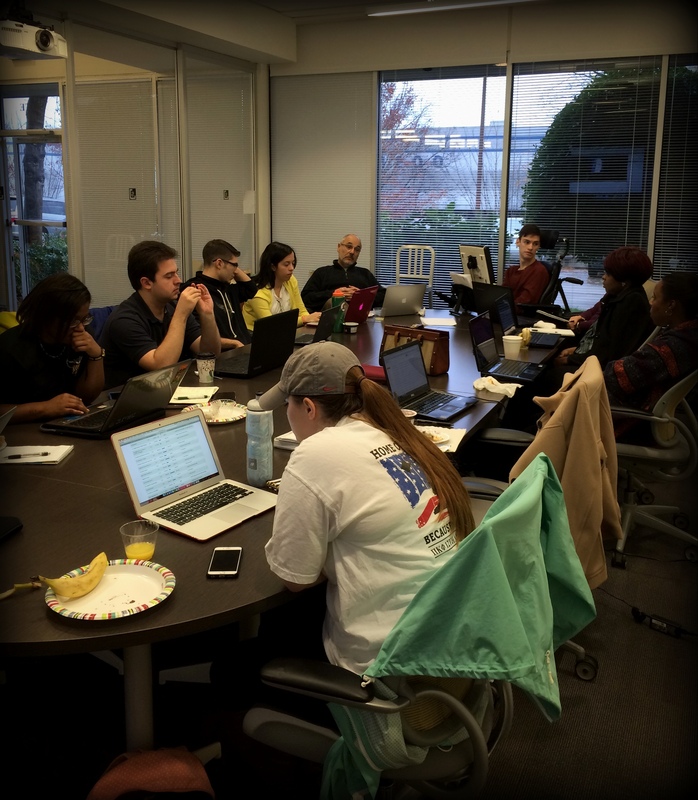 Last Friday at 6PM, all the journalists submitted the draft of their individual segment to Professor Witt. After reading through each segment, Professor Witt replied with comments on what they could add to or revise in their stories. Facts. That was the initial step to drafting the story. Now, emotion must be added, along with even more facts to present an in-depth story about the life of Christopher Thomas. The journalists will be reading and exploring how other similar news stories are structured to gather ideas for our own story. After discussing writing strategies and additional people to contact for context, the group decided upon a deadline for the final drafts so that Kevin Enners can begin merging the story segments together. The deadline for the next long story draft of each segment is November 14. Until then, the journalists will be drifting back into the unstable world of a boy who was incarcerated at age 14, and remains in jails still at age 30 serving his 40 year sentence. They will explore deeply enough to tell the true story of his young, troubled life and explore the question of why his legal quest to reduce his sentence has not been successful. Meanwhile, in the virtual world, the machinima team continues to build the avatars for the machinima story and build sets. Although the team has already created some avatars for the Pawn Shop scene, they continue to work on them, adjusting wardrobes, skin tones and body shapes to create realistic avatars that visually work well together and with the set. The machinima team had planned on filming today, but experienced problems due to a conflict between a recent firewall update and the virtual world Firestorm viewer, so filming was postponed until later this week. The team did successfully record more soundtrack voices, mainly characters re-reading some lines for sound and accuracy. Cristina Guerra continued to work on the inworld scenario textual graphics and credits for the machinima. At the end of the day, the machinima group realized there is still much work to be done as they continue to press on towards completing this compelling machinima story. Realizing the potential for the continuation of this entire virtual world journalism project, Professor Witt has urged the public relations team to both promote our project’s machinimas and written stories, and concurrently look for possible grants for future funding. At today’s PR meeting, the group focused on finding more contacts in both areas. Public relations contact spreadsheets are being completed for the top-ranked schools and programs in Journalism, Film, Digital Media, and Gaming. The group is also researching foundations and corporations with established relationship to digital media schools and virtual reality, to discover possible sources for grants to fund the expansion of our virtual world project. The project press release deadlines for the Public Relations group are coming quickly, so the completed contact spreadsheet is due on November 20. Grant source research needs to wrap up by the end of November, with query letters to possible funding organizations going out in early December. Thus, together or apart, the “divided” groups continue to work as one. This project is nothing without the journalists who have tracked down contacts to gather the information and find photos to ultimately report on and write the full story. The project is not complete without the machinima team having the knowledge of how to utilize this information gathered by the journalists to bring Christopher’s story to life in a virtual world machinima and where people can live out the story themselves. And finally, this project would never come into the public eye or have an opportunity to expand without the public relations team’s research, widespread media campaign, and grants that could support and maintain it past this semester. Pushing forward, each group plays a major role in the successful completion of this project. 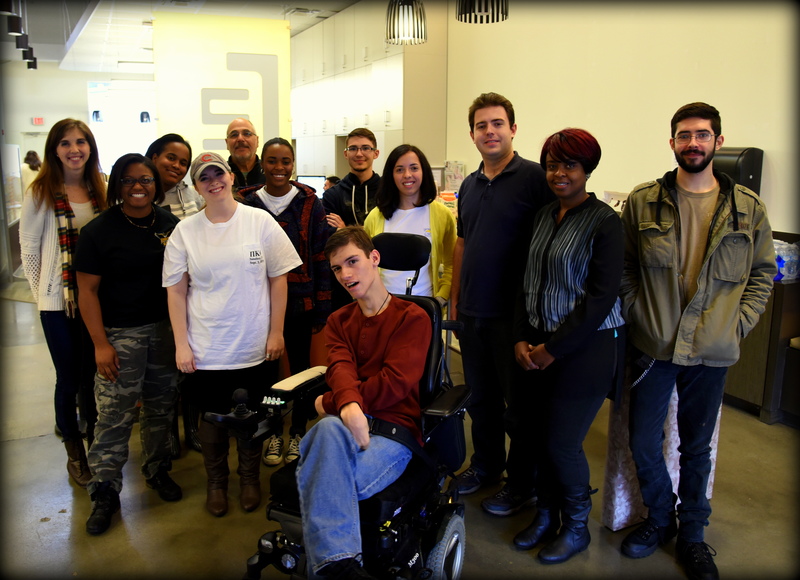 All of our creative work together is bringing us closer and closer every day to completing our project goals. JJIE Virtual World is presently offline. Watch here & JJIE.org for announcements about our new virtual world projects. at Kennesaw State University, Kennesaw, GA. Funded by a grant seeding innovative technology in newsrooms from the Online News Association.